The Museum of British Surfing will open the doors to its new exhibition venue in Braunton, North Devon for the first time on Good Friday. Its inaugural exhibition is 'The Art of Surf' – displaying 200 years of art in surfing from the sketches of early explorers through to works by contemporary British surfing artists. Among the modern artists featured will be Conrad Shawcross, Ben Cook, Mark Haywood, Al Lindsay and Maria Rivans. "Explorers and early travellers drew surfers, surfers decorated their boards – especially in the 60s & 70s, advertisers plundered surfing imagery right the way back to the early 1900s – and today there's a flourishing British surfing art scene," said the charity's director and founder Pete Robinson. The first dedicated surfing museum in Europe was started in 2003, running successful touring exhibitions – it relocated to North Devon in 2009 and has spent the last 3 years securing the building and funding, completing the design work, and so far creating two new jobs. The project's main funders are Leader 4 Torridge & North Devon, North Devon District Council and North Devon Areas of Outstanding natural Beauty. 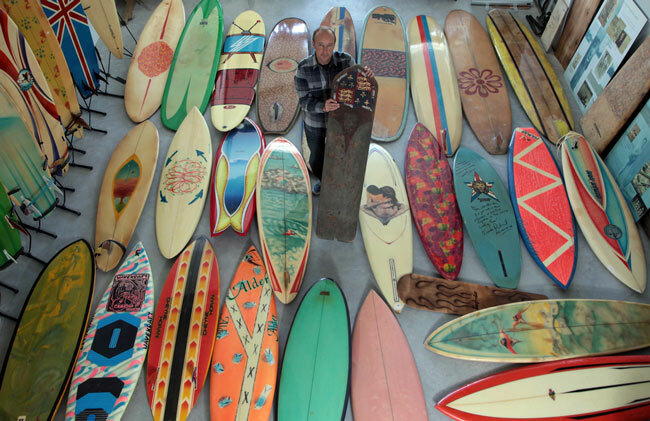 While 'The Art of Surf' exhibition will be the main feature, there's also a section on British surfing history, North Devon surfing and the local environment, and a timeline of British surfboards – displaying about a quarter of the museum's collection. "We couldn't have done it without amazing support from surfers not just around the UK, but around the world – donating items and money," said Pete, a former award-winning ITV News reporter. "I'd especially like to thank my wife Bianca and the charity's Trustees – they've been truly amazing." The Museum of British Surfing is believed to have the largest and most historically significant collection in Europe, with members of the public donating many key items to be kept for future generations to enjoy. Each year a new themed exhibition will be displayed, exploring different themes in surfing history and culture – and the museum will continue its popular touring shows around the UK. The museum's researchers are part of a worldwide network of surf historians, and their latest discovery to be revealed soon is that surfing took place in Britain in the 1800s. The Art of Surf runs until December 24th this year. Admission charges apply – see our website for details and special events.